It's finally my turn to post again. I love how it's a new cycle of having 4 wearriors, as there will be different fashion style being exhibited. Anyways, as you can see the title of the post for this week is called "Double Trouble." It's definitely a special post because it features a good friend of mine (who happens to sing with me as well under the group S4F), Hirzie. He will be helping me to showcase my two trench coats. We worked with Naqib H for this shoot, as he has always wanted to shoot a mirror-like or twin-like effect. So therefore, this post will also be also be showing Naqib's awesome photography skills. I personally love trench coats, in general, so I am quite bias towards them. I think they just look very classic and dapper. Thus, it makes it really more of my fashion preference. And now, since Spring is here, it's great transition from the thick heavy coat to a lighter cooler coat. Oh and a fun fact, trench coats were originally designed for army officers for trench warfare during the First World War. As you can see from the picture above, there are two trench coats. Both are in two different shades of grey. The left one is I would say, is graphite grey. While the right one is leaning more towards charcoal grey. 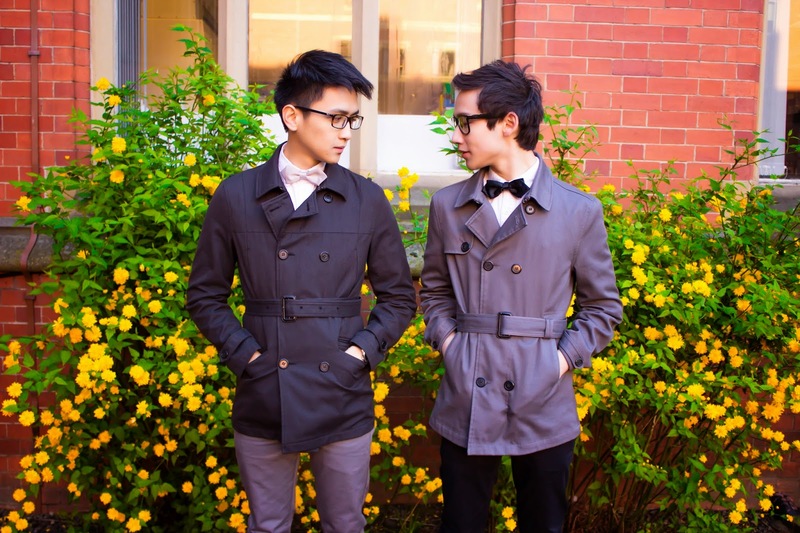 So, for this post, I'll called them graphite and charcoal coloured trench coats. Both are from Topman (as for most of my coats). Overall, I find their design and quality are splendid for their affordable price. I have decided to go for monochromatic colours: Grey, Black and White. Both outfits are the complete opposite of one another (besides the shirt and shoes). I have also added bow ties to add the finishing touch. 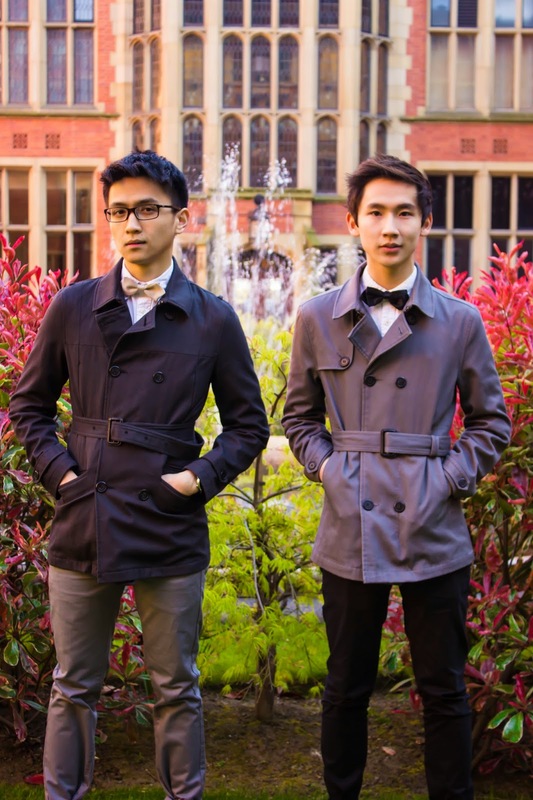 Bow ties + Trench Coats have this symbiotic relationship with one another. 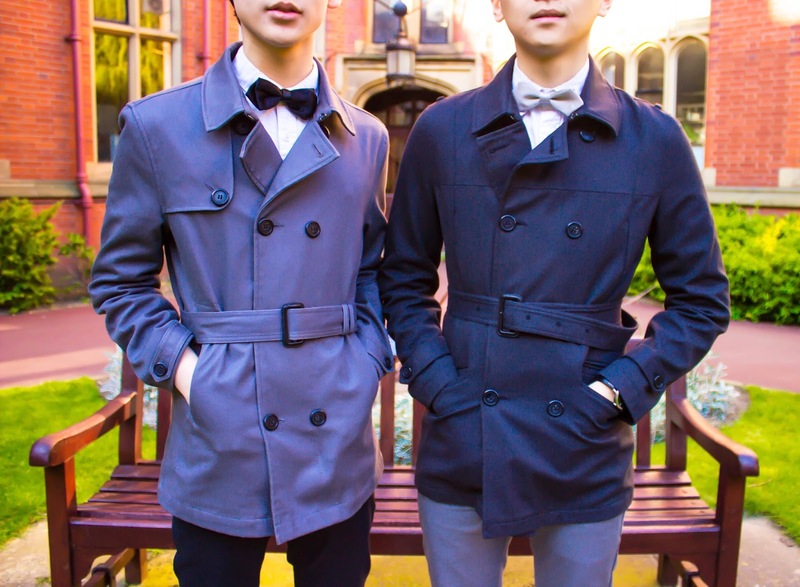 It just looks amazing when you add a bow tie with a trench coat. I will begin with the graphite trench coat. 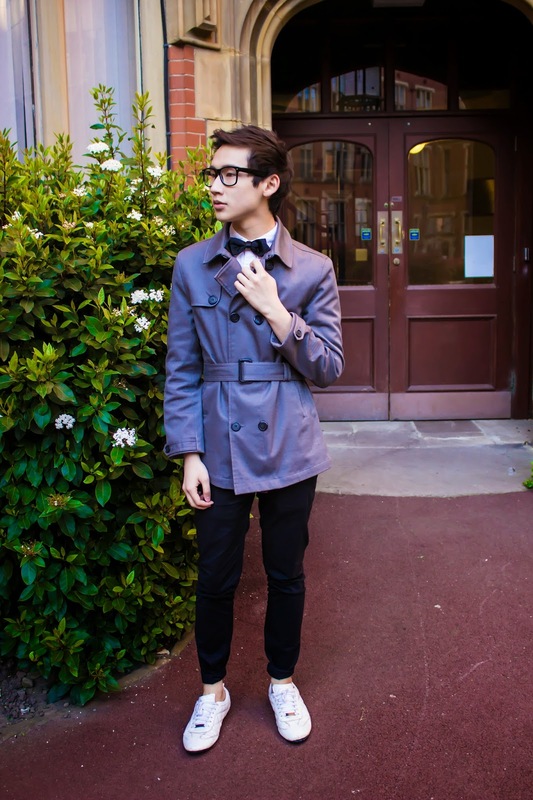 As for the graphite trench coat, I have paired it up with a black coloured diamond bow tie. Out of all the different types of bow ties, I personally love diamond shaped bow ties. It gives such classy look, as well as a casual look, thus making it very versatile looking. You guys may have noticed that I did not put the brand of the bowties, I got it from a vintage store. Sadly, it doesn't show any brand name because it looks incredible. Therefore, please do check out your nearest vintage store and you'll never know if you find a gem. The coloured of the pants is purposely matched with the colour of the bow tie to give such synchrony. 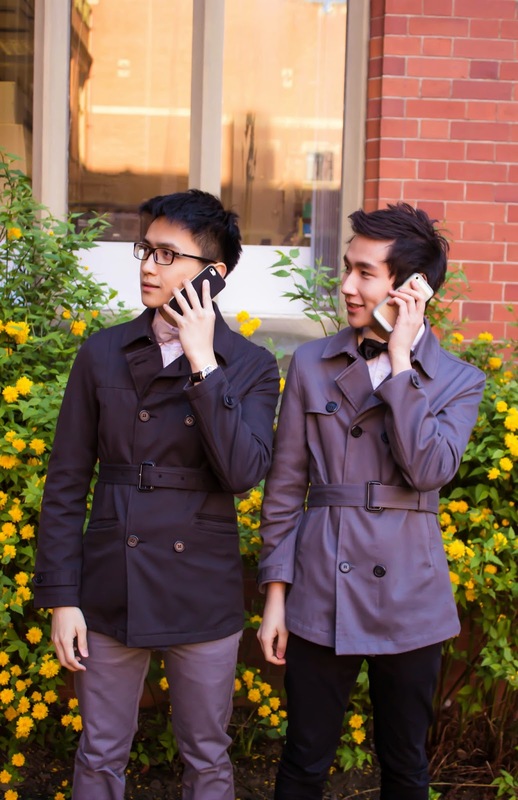 Other coloured pants that I would recommend with this graphite trench coat would probably be, white or off-white tones such as cream or beige. It would give a different vibe to the overall outfit as well, as it would brighten up everything. Moving on to the charcoal trench coat. It will be showcased by Hirzie, who has become my twin for this post. It's uncanny, how we almost have the same size for everything. Nevertheless, I enjoyed dressing him with my clothes from head to toe. Oh btw! It's his first time modelling for clothes! But, he's a natural, as he did a great job with it. 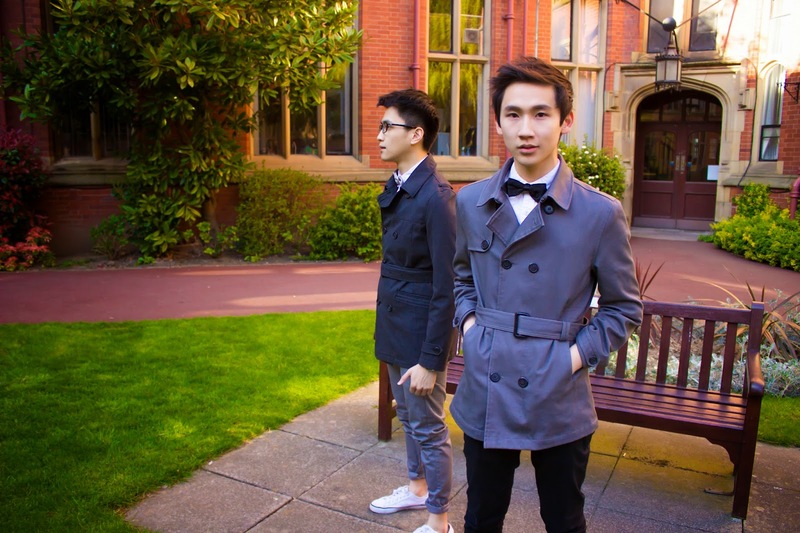 The charcoal coat is complemented with a silver diamond shaped bow tie. It just illuminates the whole outfit. However, if you are looking for a very classic look. The black coloured bow tie would work really well, as an alternative. 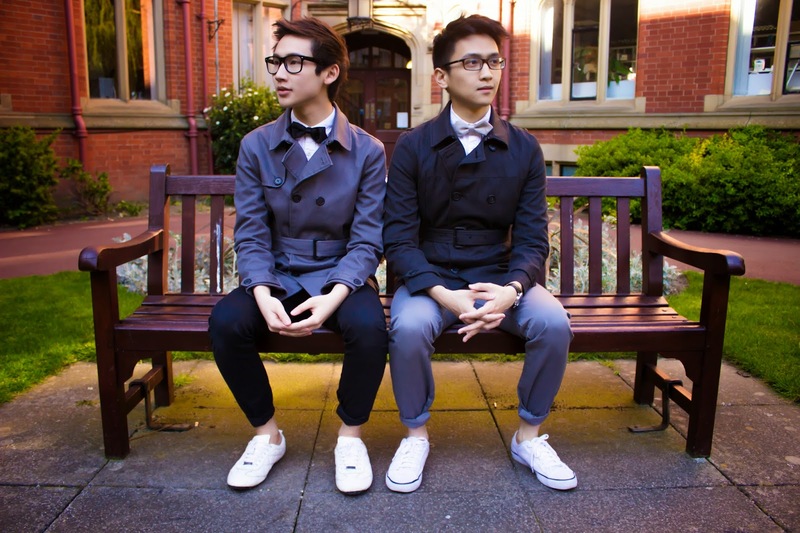 A grey coloured skinny chinos did a really good job harmonising the charcoal coloured trench coat. Similarly, another coloured pants I would recommend with this trench coat would be white and off-white colours such as beige or cream. It would look really nice. Somehow as I've tried different types of chinos from ASOS, Topman and River Island. I personally prefer ASOS's fitting overall, and the material is quite light and soft. Hence, making it very easy to cuff the trousers. As for the shoes. 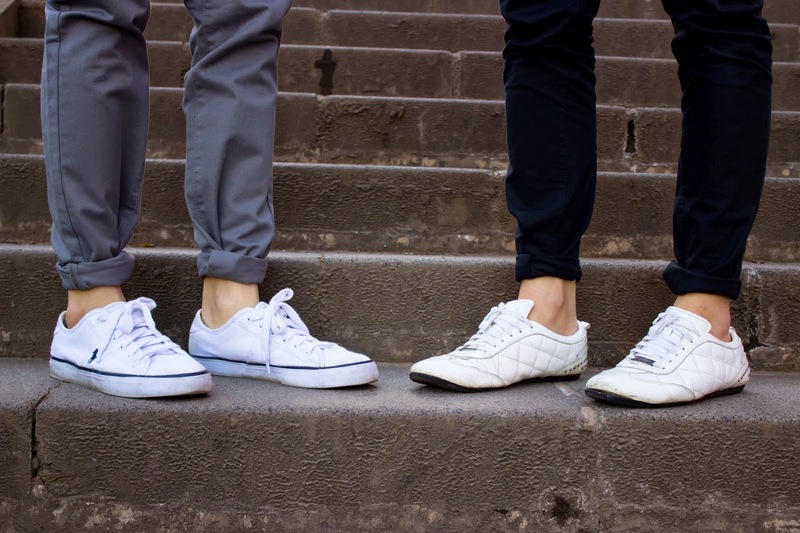 A pure white colour is needed to complete the outfit, other colours might not work because the white coloured shoes just pops out as it radiates clearly along with the outfit. There are two shoes being shown here, Ralph Lauren and Burberry. I purposely chose these two shoes to show the characteristics of the shoes. It really depends on your preference as well, the Ralph Lauren one is more down to earth, while the Burberry one is much more classy and dashing. Additionally, it really depends on how you feel and the occasion you're going to attend, to be able to pick which shoes. Oh the bonus point about the Burberry shoe is that it's waterproof. That is all for this week! But before, I end the post. I will be showing some of Naqib's pictures. So, I will be bombarding you guys with a few photos, just to illustrate the double trouble theme. There are more photos of this photoshoot. It was so hard to choose for the blog. But I ended up picking these. I didn't wanna flood you guys with our photos. Might upload on our Flickr or something. A big thank you to both Hirzie and Naqib for everything. Do check out Naqib's Instagram at @naqibdoespics and his Tumblr @naqibselectives. Feel free to contact him to hire for a photo session. Stay tuned for Wearrior Alia's second post next week! You wouldn't wanna miss it.